$3,250.00 Order of Merit of Hungarian Republic, Grand Cross (57 mm), Civil Division, 1947- 1949. Massive, beautifully made piece in very fine condition. Comes with original mint marked connecting link and ornate suspension loop. Just 121 of the Grand Crosses were ever awarded, and only a small minority of them were the civilian version featuring gilded rather than enameled center shield. $1,300.00 Order of Merit of the Hungarian People's Republic, 1st cl. Breast Star, 70 mm, 1949-1953. Extremely rare decoration: one of only 169 in First Class ever awarded. In very fine condition. $1,800.00 Order of Merit of the Hungarian People's Republic, 2nd class set 1949-1953 issue. Includes 2nd cl. Breast Star (59 mm), "Small Decoration" on a ribbon with miniature badge designating 2nd class of the award, Ribbon Bar with miniature badge and custom-made Presentation Case. Only 174 of the Second Class sets were ever awarded. In superb condition. $1,600.00 Order of Merit of the Hungarian People's Republic, Breast Star, 2nd cl., in silver gilt, 1943-53. Extremely rare piece in near mint condition. $1,450.00 Order of Merit of the Hungarian People's Republic, 3rd Cl., 1949-1953, in original issue presentation case. One of only 285 such sets ever awarded. $695.00 Order of Merit of the Hungarian People's Republic, first version Fourth Class decoration with Authorization Card, awarded to a Soviet citizen on 1 May 1950. $455.00 1976 Order of Merit for Socialist Hungary in presentation case. $295.00 Order for the Socialist Homeland, in original presentation case. Excellent condition. $275.00 Hungarian Peoples Republic "4th of April" Order of Merit decoration with elaborate ribbon bar. $20.00 Air Force Medal for Safe Flying, 1500 Hours with a ribbon bar. $22.00 Air Force Medal for Safe Flying, 2500 Hours with a ribbon bar. $29.00 Air Force Medal for Safe Flying, 3500 Hours with a ribbon bar. $25.00 Commemorative Medal for Service to the Fatherland, 1st cl. (Gold). In excellent condition. $40.00 Medal for Protecting Public Safety (aka "Hungarian Police Medal"), 1st class (in gold). In excellent condition. $30.00 Fire Department Medal, 1st cl. (gold) with a ribbon bar; in gilded brass and enamel. $25.00 Fire Department Medal, 2nd cl (silver). $29.00 Hungarian Partisan Commemorative Medal, miniature issue. $50.00 Medal Commemorating 25 Years of Scientific and Technological Cooperation	between USSR and Hungary. 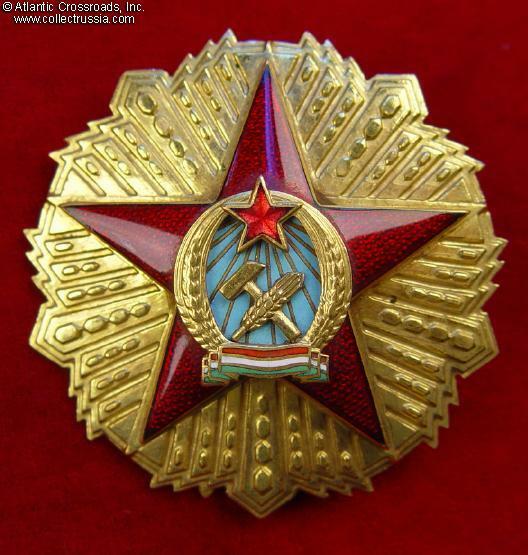 Extremely nice quality award produced at the Moscow Mint and awarded in 1974. $95.00 Hungarian Border Guard Porcelain Presentation Plaque, with original fitted issue case. Huge and impressive. $20.00 Excellent Border Guard, miniature badge, circa 1950s. Excellent condition. $25.00 Badge for Excellent Social Work, circa 1970s. Excellent condition. $30.00 Badge for Excellence in Hydroelectric Dam Construction, circa 1970s. Excellent condition. $20.00 Excellent Worker (Kivalo Dolgozo) badge, Type 4, with original issue box and miniature badge. Late 1970s - 1980s. $35.00 Honored Employee of Agriculture, circa 1960s. Gilded brass, enamels, very high quality. $12.00 Gold Badge for Sports Achievements in the Military, circa 1960s - early 70s. Very fine to excellent condition. $12.00 Silver Badge for Sports Achievements in the Military, circa 1960s - early 70s. Very fine to excellent overall condition. $55.00 Hungarian Ground Forces officer's service cap. Small size, approximately 55 (US 6 7/8).